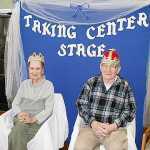 Ruby Neel and Johnny Bass were crowned King and Queen of Moore-Few Monday to celebrate Nursing Home Week. Johnnie Walker, 81, died Thursday, May 12, 2005, at Moore-Few Care Center. Family information and funeral arrangements will be announced later by Ferry Funeral Home. Denny Chrisenbery of Bronaugh won the Street Stock Special at Nevada Speedway on May 7. Chrisenbery won both his heat and the feature, his first victory of the season. With the win, Chrisenbery earned $500 in the Special.